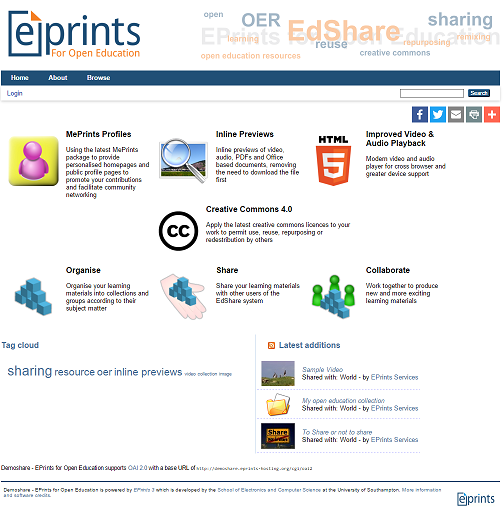 Building upon the success of the educational content sharing platform EdShare from the University of Southampton, we are pleased to bring you EPrints for Open Education on our latest EPrints core. Providing you with a flexible platform to support your engagement with open education practices. Whether for your school, project, collaborative network, institution or organisation and whether you intend to share your resources locally, regionally or world-wide our EdShare solution can be customised to meet your needs, allowing you to host, manage, share and collaborate on teaching and learning resources in one place. Over the past year EPrints HQ has been busy migrating the original EdShare developed from the EdSpace and OneShare projects to be compatible with the latest EPrints 3.3 core but this is only the beginning and we are committed to supporting institutions with their policies and practices for open education. This migration was an essential stepping stone, we are already working in collaboration with others in the higher education community to develop the platform further to start to bridge the divide between emerging digital learning spaces and existing practices.